Last week I drove to southwest Oklahoma to do an interview about a rodeo Bible camp. I love to get to go to Oklahoma, and I love rodeo, so it was a win-win situation. Driving home from the meeting I had plenty of time to think. One thing the guy I interviewed said really stuck with me. “We try not to scare them with Hell.” I couldn’t agree more. I’d probably be more into organized religion hadn’t it been for someone like Mr. Taylor. Growing up I attended a Lutheran church with my family. For as long as I can remember, I didn’t like going to church. It wasn’t what they were teaching, but how they were teaching it. As a kid we were taught right from wrong by our parents, but also had to obey the religion we were being taught. I really didn’t like that. By the time I was in high school and later college, church became very unappealing. Our pastor was black and white. there was no middle ground with him. You were either good or bad an if you were the latter, you were going straight to hell. Don’t pass go, don’t collect $200. Once he said there were no animals in heaven. I had a tough time believing all of God’s creatures weren’t included in the ever after. I’ve had the opportunity to attend other churches and find my self comparing those to my childhood church. One thing remains clear, you don’t have to go to church to believe in God. I believe in God, and often pray. I pray for my family, friends and guidance through difficult situations. And I believe God has helped me in those times of need. I ran across this quote some time ago, “Cowboy Logic: “Going to church makes you a Christian about as much as watching a rodeo makes you a cowboy.” I believe it’s totally appropriate to my feelings about organized religion. I’ve heard religion and politics referred to as things you don’t talk about in polite company. I agree with that. No two people will agree on either subject and it will not be a pleasant experience if they do disagree. However people can agree to disagree. 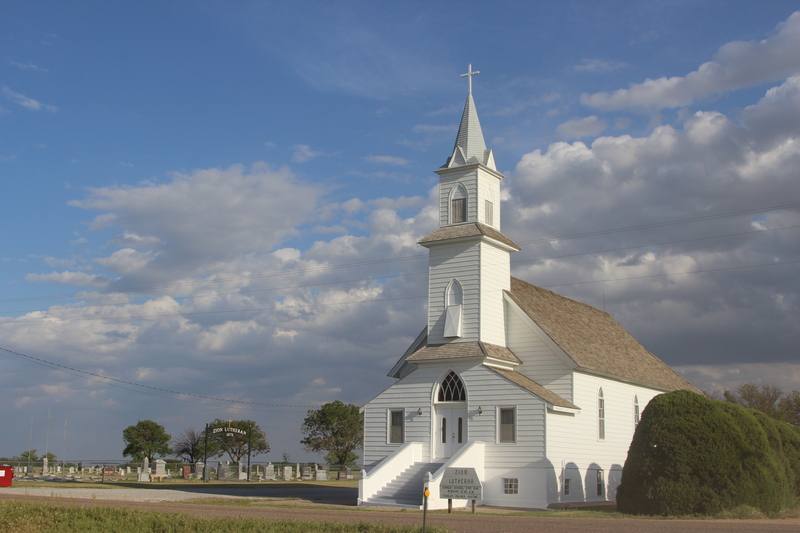 My favorite little country church, Zion Lutheran near Offerle, Kansas. I’m not much one for either religion or politics. Ask my husband or my coworkers and they know the glassy-eyed look I get when they start talking about politics. I can’t stand the rhetoric and the crap that goes along with elections, lawmaking and the like. Sure, I will go vote and do my part as far as that goes, but part of me always questions, “Why go vote? My one little vote will not change the world.” But I continue to do it anyway, hoping my vote would be the one that was needed. Religion has always been an issue with me. Sure, I believe in God, and I believe I will go to heaven when it is my time, but why must I have someone tell me that their way is better than mine? Or if I repeat a certain prayer 82395984752 times, I will get into heaven that much faster. Or go to church every Sunday. Or confess my sins in front of someone. Or give money to the church. I don’t get some of the things people do in certain religions or why they think just because they practice a certain religion that they are a better human being than those of other religions. Because they are not. Heck, in my eyes some of the things they do to become a “better _______” make them a not-so-nice individual. I was raised in the Lutheran church and confirmed in it, but I can count on one hand the number of times I have been in that church since I graduated from college. My mantra has always been, “You don’t have to go to church to believe in God.” And believe me, I do believe. When it was time for me to get married, the one thing I was certain of during the wedding planning process was I didn’t want to get married in a church. Nothing against the church or the pastors, it just didn’t fit me or my beliefs. I was perfectly happy with the cowboy preacher that we chose. I truly believe Boyd had a special connection with the Lord and you could see it when he got to preaching. I think of God when I see the works of Mother Nature. Someone had to create those things – the beautiful sunrises and sunsets, the heat and the cold, even the annoying bugs. 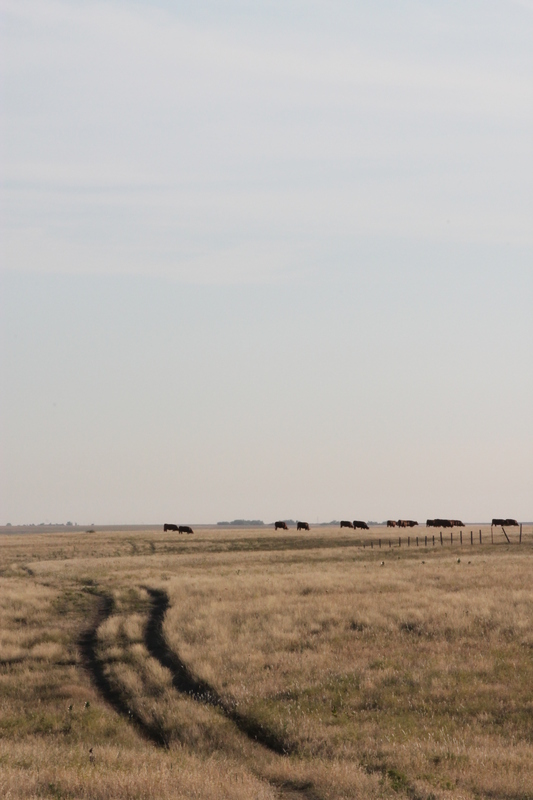 Riding through the pastures in the early morning make all of those creations evident to me. Even the dive bombing birds, rattle snakes and the badger hissing at me. I thank the Lord I am able to saddle my horse and enjoy a ride before my day really begins.